Cold viruses can be found everywhere. In fact, they are all around you, living on your computer desk, mouse, mobile phone and other objects around your home. It is important to remember that being exposed to a cold or flu virus does not mean you'll catch a cold. The human immune system is a miraculous shield that helps protect us from the daily onslaught of invaders. When in good health, this is done quite easily. However, if your immune system is impaired, it becomes easy for viruses to take hold. 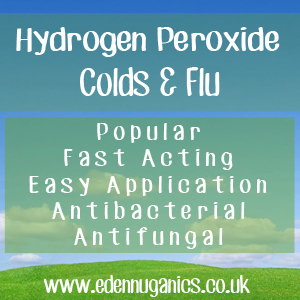 Hydrogen Peroxide is a highly reactive liquid comprising of two hydrogen and two oxygen atoms. In high concentrations it has been used for bomb making and rocket propulsion systems as well as many other industrial applications. However, at lower concentrations and at the right dosage, H2O2 can work as a completely natural disinfectant with an array of unique antiviral and antifungal properties. The use of H2O2 can provide remarkable results when treating colds and flu. Although it may seem slightly odd, the best method is to simply add a few drops of 3% Hydrogen Peroxide into each ear. You will instantly hear a bubbling sound, this is completely normal and harmless. This sensation should die down within 2-3 minutes. Once the bubbling subsides, drain onto a tissue and repeat with the other ear. Although the use of this remedy is known to be safe for children, it is best to further dilute the mixer from 3% down to 1.5%. The loud bubbling sensation may also frighten children, so it is best to get a person they trust to apply the hydrogen peroxide to their ears. Drink Hot Liquids - Hot liquids are great for relieving nasal congestion as well as helping to soothe the often inflamed membranes that line your nose and throat. If you're so congested that you can't sleep at night, try warm water with honey and apple cider vinegar. The antibacterial and antiviral properties of ACV make it ideal for decongesting as well as promoting a fast recovery. Stay Warm and Rested - Staying warm and resting when you first come down with a cold or the flu is essential although, in our modern world, sadly, not always achievable. This really helps your body to direct its energy toward the immune battle and dramatically speeds up recovery times. So give it a little help by resting. Caution: Remember, more severe conditions such as sinus infections, bronchitis, meningitis, strep throat, and asthma, can look like the common cold. If you have severe symptoms, or don't seem to be getting better, call your doctor.